This summer Robert Babicz, aka Rob Acid, the producer from Cologne brings his live show to a selection of events. A "non-DJ" who performs only original music - either his own compositions, collaborations or remixes - Babicz aimed to ignite parties with music crafted by synaesthesia, his ability to see sounds and hear colours. For the first time ever, Babicz brings his show to Burning Man, 29 Aug 29 to 5 Sept. The playa will resonate with unique aural textures and otherworldly visuals as he shares his music. Out of respect for playa tradition, Robert won't pre-announce his sets but fans will have multiple opportunities to join him on voyages beneath the desert sky. 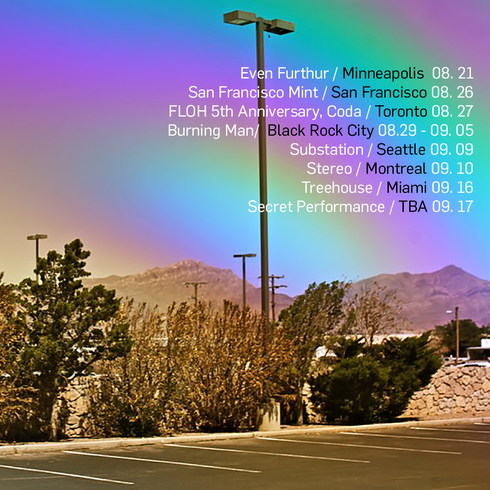 Other tour highlights include Robert Babicz All Night Long at Coda, Toronto, 27 Aug - where he will play a seven-hour show to celebrate FLOH's 5th anniversary. Fans of tough, twisted, acid-drenched electronica won't want to miss a rare performance under his Rob Acid moniker at Even Furthur, Minneapolis, 21 Aug.
With more than 1000 releases for labels including Bedrock, INTEC, Mille Plateaux, Systematic, Audiomatique, K2, Treibstoff, SUGA, Punkt, Praxxiz and his own imprints, Babiczstyle and Dirt Cuts, Robert has a conjurer's chest full of musical spells. Every gig is unique, with 100% creativity lazer-focused at the dancefloor. "I don't play the instruments," Robert says. "The people at the party play me."